Today we want to talk about Juno in celebration of #WomensHistoryMonth! We have written before about our wonderful “greeter,” Juno, the transparent anatomical model. She has become a mainstay here, but Juno is a well-traveled woman! 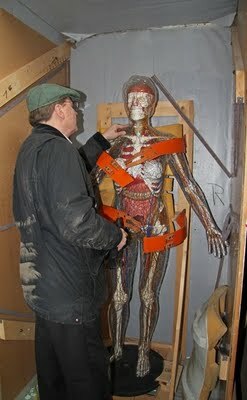 In the 1920s, the Deutsches-Hygiene-Museum in Dresden, Germany, created a fully operable model of the human body, depicting “the human body as a machine.” Despite becoming part of East Germany after WWII, the museum continued to make these models and some of the employees managed to leave East for West, helping to create the Köln Krankenhaus Museum. It was here that Juno was “born”; Franz Tschaikart of Cologne, Germany, crafted her on commission from the original German Hygiene Museum. In 1950, a friend of the Cleveland Health Education Museum paid $15,000 to bring Juno to Cleveland. She first appeared in public on November 13, 1950, and a contest was held to name her. 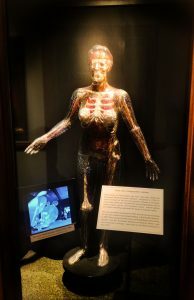 ‘Juno’ took her name from the Roman queen goddess of women–and dutifully helped explain the female body to museum goers until the health museum closed in 2007. In 2011, Juno moved to her present home in the Dittrick’s museum collection after being long entombed in her original packing crate. As the first transparent woman made in West Germany after the war, she has been–and remains–a kind of ambassador. Sadly, CHEM (later known as HealthSpace Cleveland) closed in 2006 and a vestige of its exhibits and staff came over to the Cleveland Museum of Natural History in 2007. There they now now offer programming and exhibits to help understand the physiology and frailty of the human body, the sources of disease and the grounding of wellness. Our Juno greets visitors as they enter, standing as a testament to transparent pedagogy–and, in her new hat, proving that being partly “invisible” can’t keep her from making a statement. This hat was worn by a friend of the museum at the #WomensMarch in DC, and donated here as an artifact of a profoundly historic moment in US history. Interested in Juno and her male counterparts? Take a look at the Wellcome’s Object of the Month. You might also enjoy Klaus Vogel’s article: “The Transparent Man – Some comments on the history of a symbol,” in Robert Bud, et al, Manifesting Medicine: Bodies and Machines [Artefacts, Studies in the History of Science and Technology , Vol 1], Amsterdam, the Netherlands : Harwood Academic, 1999.
 www.dhmd.de/fileadmin/user_upload/uploads_drei/pressematerial/Permanent_Exhibition.pdf – accessed 30 August 2013.